(146.910 if main repeater is down). Weather spotters are urged to participate. Note: The monthly net will be cancelled and replaced by an alert net if there is severe weather in the area. 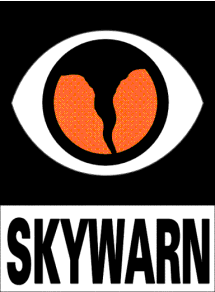 Skywarn is a program of the National Weather Service. While the National Weather Service accepts reports from anyone during severe weather, they give more credence to reports that come from trained spotters. You can become a trained weather spotter by taking a free class given by the NWS. Taking the class and becoming a trained spotter does not obligate you to chase storms (chasing storms is actually discouraged), to go to certain locations and watch the sky, or anything else. If you happen to be in the right place at the right time and want to make a report, you'll be better prepared to do so. See the National Weather Service in St. Louis Skywarn (LSX - SKYWARN) Web page for more information. Are you a licensed amateur radio operator? Report severe weather over the air. Amateur radio operators who are trained weather spotters often send in their reports via radio. St. Louis Metro Skywarn is a team of amateur radio operators managed by the St. Louis County Police Department Office of Emergency Management. This team activates a radio net when the National Weather Service indicates that there is severe weather in the area. It takes reports from trained weather spotters in St. Louis City and County, Missouri and then forwards these reports to the National Weather Service and the Office of Emergency Management. Reports are made by county. Weather spotters within St. Louis City and County who are amateur radio operators are urged to call WB0AAF on the 147.360 MHz (+) repeater during severe weather to give their reports. (146.910 (-)(141.3 Hz) is the backup repeater should 147.360 be down.) By doing so you will insure that the information reaches both the NWS and the Office of Emergency Management. As the National Weather Service wishes to receive reports by county, this program is specific to St. Louis City and County. Other counties in the vicinity maintain their own Skywarn groups. Weather information is made available through other media. The amateur radio service is limited to receiving spotter reports. Other media, such as NOAA weather radio (162.550 MHz), television, and broadcast radio provide the current weather conditions.